How to Prevent Pimples After Epilation? How Do I Prepare My Legs for Epilation? Is It Better to Epilate Wet or Dry? How Do I Calm My Skin After Epilating? How Do I Stop Itching After Epilating? I’m not going to lie, epilation hurts. Unfortunately, depending on what you’re used to, it may even hurt more than waxing, as it’s a slower, longer lasting process compared to the quick burn of a wax strip being whipped off. Some people have even likened the pain of epilation to getting a tattoo. Oh man, so why are we doing this again? Well, good news! Epilation comes with a lot of benefits, such as not leaving you with spikey stubble, and being able to go weeks at a time without having to worry about hair removal. Epilation is also more gentle on your skin than waxing because it doesn’t adhere to the top layer of skin like soft wax does. And, the pain can be reduced significantly, even eliminated, if you follow a few simple tips. So, how can I make epilation less painful? I’m glad you asked! Following the epilation tips in this guide will go a very long way towards achieving a less painful epilating experience. Read on for the tea, sis! Soaking in hot water relaxes and opens your pores, allowing hairs to be removed much more easily. Waterproof epilators that are designed to be used in the bath are a great way of ensuring that you’re not fighting against tight, closed pores when you epilate. The warm water helps to lubricate everything and take away some of the intensity of the pain as well. You definitely want to make sure the epilator doesn’t try and pick up your skin on its way past. Holding your skin taut is the best way to do this, and is particularly important in sensitive areas like the underarms and bikini line. This isn’t a long-term solution, but it can help significantly for your first few sessions until your skin gets used to epilation. Take an over the counter painkiller about 30 minutes before you epilate to give it time to kick in. Or use a numbing cream. Caffeine actually makes you more sensitive to pain, so it pays to wait until any caffeine is out of your system. Ideally, epilating in the evening, a good 8 hours after your last coffee is the best, as your skin is less sensitive later in the day than first thing in the morning. Similar to the above two tips, your sensitivity to pain is greater later in your menstrual cycle and when you have your period. Your best bet is to try and epilate earlier in your cycle, or around the time of ovulation when you are feeling most invincible! Remember the first time you plucked your eyebrows? It probably hurt a lot more than it does now. Believe it or not, your skin will get used to epilation, and the pain will decrease dramatically the more you do it. The trick is to keep doing it! The rewards will arrive further down the track! 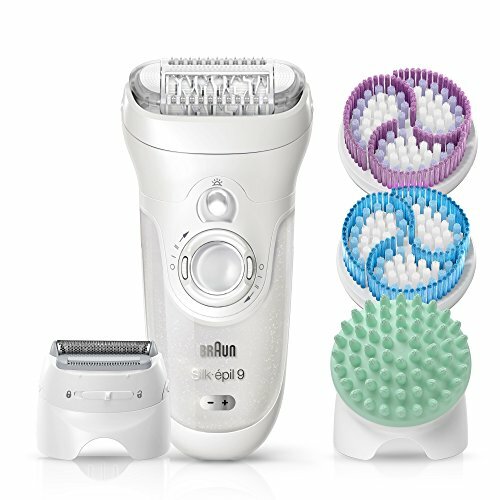 Want to find a good epilator? Read my reviews on the best epilators for women! But what about those awkward places? The main thing here is to make sure that the skin is as taut as possible so that the epilator can only grab your hairs and not your skin! Put your arm behind your head as far as you can so that your underarm skin is stretched as tight as you can get it! Then, gently run the epilator over your underarm at a 90˚ angle, being careful not to apply any undue pressure. It’s also important to make sure the hairs aren’t too long (shave first and wait a few days for it to grow out), and that they are not greasy with any deodorant or other products. Clean hairs will be gripped better by the epilator tweezers. If you’re using a dry epilator, using a little bit of baby powder can help the epilator to grip your hairs. Using an epilator head that is designed for sensitive areas can help too. Some epilators either come with a completely separate head that is narrower and keeps the tweezers a little further from your skin, or an attachment that acts like a guard and lessens the number of tweezers making contact. Tips for the bikini line are pretty much the same as for the underarms. It’s really important that the skin is taut, that you don’t apply pressure with the epilator, and that if possible, you use an epilator head that is designed for the bikini area. Braun’s Silk-Epil 9 Epilator comes with such attachments. Oh and don’t forget to trim first! 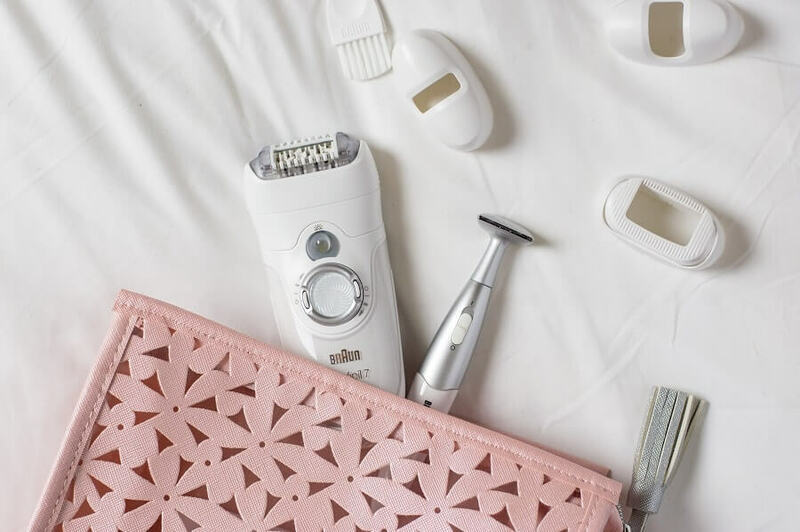 Want to find out more about epilator models that are good for down-there? Read this article on the best epilators for Brazilian! But if you’re looking specifically for Braun epilators, here, read this article. Ok, so you’ve followed these tips and finished epilating. What should you do after epilating? Good question! What you do after can be just as important as the actual epilation itself. Immediately after epilating, your skin might be red and sting a bit. Using a cold compress can help to bring down the inflammation and ease the stinging. Using a gentle, non-perfumed lotion or Aloe Vera gel can be a great way to soothe angry skin that is still getting used to epilation. In order to keep your hair follicles healthy and prevent conditions like folliculitis, you need to make sure that you don’t introduce any foreign bacteria to freshly epilated skin. Wearing clean, loose-fitting clothes for the next 24 hours is important to let your skin breath and keep your pores happy. If you want epilation to be your new go-to method for hair removal, exfoliation needs to become part of your skin care regime if it isn’t already. Removing dead skin cells and keeping your pores clean is essential in ensuring that you don’t get ingrown hairs after epilating. For best results, exfoliate regularly, but not immediately after epilating while your skin is still vulnerable. An alternative to exfoliating when in the shower is to dry brush your skin. Exfoliation via dry brushing is also more effective than wet exfoliation, as the dead skin cells come away more easily when they’re not swollen and sticky with water. But, go easy with it, there is definitely such thing as too much exfoliation! Now you’ve got the inside scoop on less painful epilation, check out these products for the ultimate epilation experience. 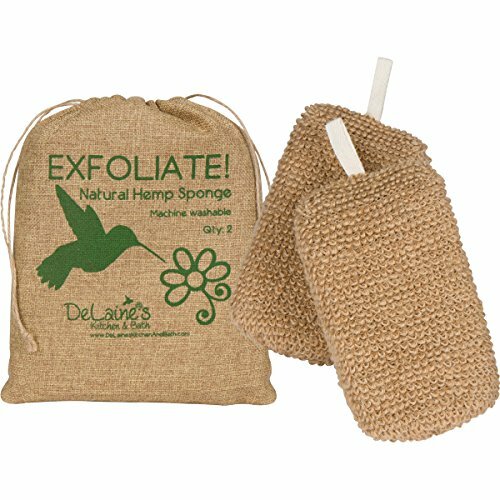 These Hemp Sponges use the natural abrasiveness of renewable Hemp to exfoliate and give your whole body an uplifting scrub. They lather amazingly when used with body wash making them a great option to give your legs a quick once over before epilating, and a perfect alternative to harmful plastic micro-beads found in many commercial exfoliating body washes. This dry brush made of wood and all natural boar bristles is designed for dry brushing your skin, giving it the ultimate stimulating exfoliation that is ideal to prevent the ingrown hairs that can result from epilation. The medium length handle makes it comfortable to use and easy to reach awkward places in the middle of your back. Organic Aloe Vera gel is a safe option for moisturizing and soothing skin immediately after epilation. With a good quality gel like this one, you don’t have to worry about any irritating perfumes or parabens causing problems for your newly epilated skin. This is probably the best epilator on the market right now. It is easy to use, extracting hairs more effectively than cheaper models and can be used wet or dry. It also comes with numerous attachments for epilating different parts of the body, and separate attachments for exfoliating. This is a personal choice, and it depends on how quickly your hair grows back. But really, there’s nothing stopping you from epilating as often as you like. And when you’re just starting out, epilating more often (when there are fewer hairs to remove) will help reduce the pain. Bumps and pimples from epilation can be prevented by making sure that both your skin and your epilator are clean before use, that you keep your skin clean and dry afterward, and by exfoliating regularly. Make sure you have exfoliated your skin and washed it so that it is clean and free of any oils or products that might make it hard for the epilator to grip your hairs. Then, take a long hot bath or shower to open your hair follicles and make the hairs easy to remove. This is a personal preference, but in general, hairs will be easier to remove after soaking in warm water so the better option would be to purchase a wet & dry epilator, so you can have the option of epilating both in the shower and out of it. Using a cold compress like a face cloth soaked in cold water, or a gel pack that has been refrigerated is a great way to calm your skin. Or, you can use the shower head to rinse your legs with cool water too. If a cold compress or cool shower doesn’t help, try using a soothing lotion or Aloe Vera gel. I hope you’ve found these epilation tips useful, and feel ready to put your newly gathered knowledge into action! Be sure to comment and share your epilating experience with us. Thank you for reading! Eyebrow Threading vs Waxing – Which Gives the Perfect Eyebrows?